Angular contact ball bearings are designed to withstand combined high radial and axial loads at the same time. Made of an inner ring, outer ring, ball and a cage, angular contact ball bearings are normally used in groups of two or more. 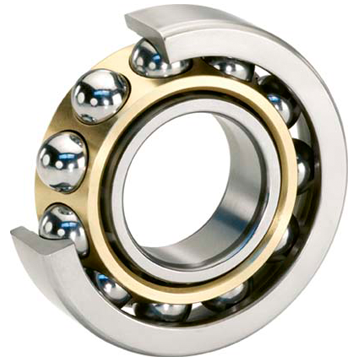 These bearings have raceways in the inner and outer rings that are displaced relative to each other in relation to the axis of the bearing. Angular bearings are designed specifically to accommodate simultaneous radial and axial loads with the axial load capacity increasing with the angle of contact. Also known as spindle ball bearings, angular contact ball bearings generally support a contact angle between 15 and 40 degrees. Usually angular contact bearings are mounted in a group of two or more with rigid or elastic spacers in between. Another option that is more economical is to have a double row angular contact ball bearing, although using multiple single row bearings may offer more flexibility. As well as the different types of bearings there is also a range of styles of shielding and seals which help prolong the life of the bearings. Some of the usual shields and seals available include: single seal, double seal, single shield and double shield. Bearings with seals offer better lubrication while shielded bearings have a higher speed capability. At Hunt Bearings we are a leading supplier of bearings for all types of industries and we work with a range of trusted manufacturers to provide authentic parts. No matter what you need, at Hunt Bearings we will be happy to help you find the right products for your specific application. Get your free quote today by giving us a call on 01256 761067.